Our highly durable Transparent Level Gauges are perfect for pressure vessels, boilers and tanks. The robust construction of our Transparent Type Level Gauge ensures that it can easily handle high-pressure liquids of different kinds. Use of mica protected gauge glass ensures its ability to withstand high temperatures. 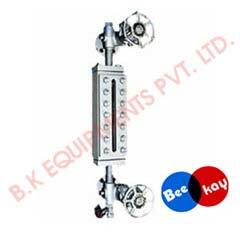 Today, we are well reckoned as one of the foremost Boiler Transparent Level Gauges Exporters in the market. The high quality glass used in the Transparent Glass Level Gauge does not break easily and provides a clear visual reading.